Residents of Cambridge Grove, Hammersmith are concerned that H&F Council is not properly maintaining the historic wall and railings that date back from the time of the Crimean War. The wrought iron and cast iron railings have survived a near miss by a V2 flying bomb, a gas explosion in the street and the British climate for the last 150 years. They are relatively rare. However, their future maintenance is now being questioned after H&F Council confirmed that “funding needs to be identified to repair the collapsing section of this wall. Medium to long-term conservation of the wall will be subject the Council's usual approval procedures and funding for implementation”. But, as H&F Conservatives are lining up a £1.6m cut to the highways maintenance budget this response appears more than a little disingenuous. My fellow ward councillors and I intend to pursue this further. I will let you know how we get on. You're right, these railings with their piers and cappings are quite rare, especially for Hammersmith. 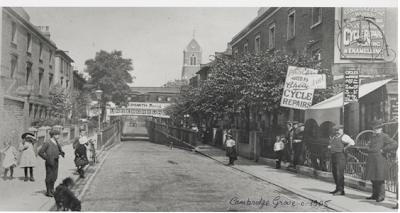 The Cambridge Grove and Leamore Street Residents Association asked us (Brackenbury Residents Association) to support them in their request for listing from English Heritage. We were very happy to do that and the H&F Historic Buildings Group also supports listing of the railings. The council is talking about the regeneration of Hammersmith, but their emphasis is on specific site developments like NCP and the town hall project. We feel that regeneration can only happen if you consider the upgrading of the bits in between. We (CG&LSRA) are campaigning for a joined up view that will benefit everybody who lives in or works in Hammersmith.